An adventurous venture into the woods often leads to blisters and twisted ankles. Modern footwear offers a solution, but ruins a fantastic scene. 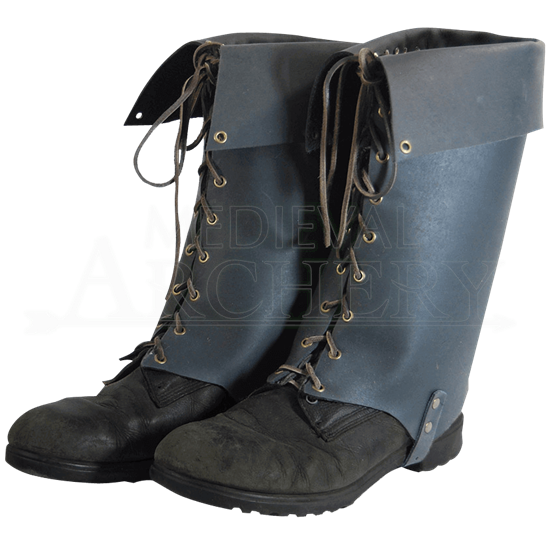 Wherever the quest may lead, the Simple Gaiters will ensure you stay in character. These leather overshoes feature oversized cuffs, a design suitable for medieval fantasy. It slips easily over your boots, a rivet strap loops around the sole for firm hold. Leather strings tie up the front to secure the fit. Enjoy the comfort of your favorite footwear, and the fun of expressing your character with these simple gaiters.